How to recognize potentially hazardous roof or floor adhesive, mastic, or sealant that may contain asbestos. This article provides dates of manufacture of asbestos-containing adhesives, mastics, sealants, and includes photographs and text describing the appearance of such products. While an expert test by a certified asbestos testing lab is required for sure identification of the asbestos content of most materials, we point out that some materials can be recognized as asbestos-containing by simple visual inspection, and others may be treated as presumed asbestos containing products based on the product type, age, and or date of installation. 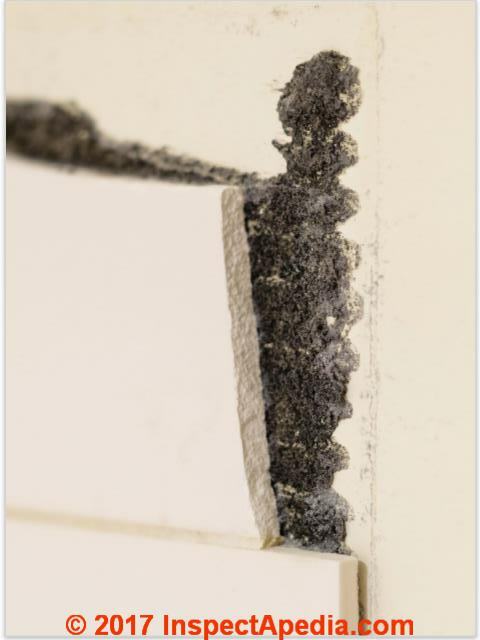 This article series answers questions about floor tile, sheet flooring, or roofing cutback adhesives or mastics that may contain asbestos.Does or did roofing mastic products & sealants contain asbestos? What are the hazards of demolishing or working on floors or roofs where asphalt-based asbestos-containing mastics, cutback adhesives, or sealants were used? Page top photo of black mastic floor tile adhesive provided courtesy of reader G.M. So excluding time to move from patent into production, it seems reasonably safe to guess that asbestos-containing cutback adhesives were in use at least until that date, possibly a bit later. Having examined asphalt-based adhesives used in floor tiles as well as in roofing mastics from a variety of installations, I cannot say that there is an easy way to recognize which contain asbestos and which do not simply by visual examination of the adhesive itself. 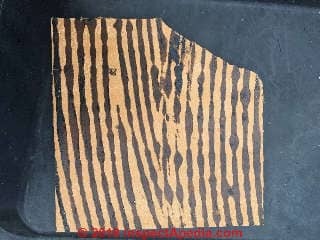 Floor covering materials: Consider the materials with which the cut-back adhesive was being used. 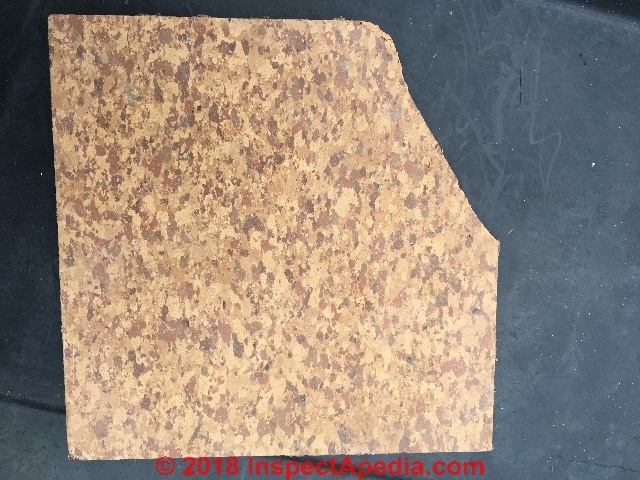 For example, if the adhesive was used for asphalt-asbestos floor tiles or vinyl-asbestos floor tiles, then it would be reasonable to suspect the adhesive of also containing asbestos. Water-soluble tile mastics: Some floor tile mastics that appear difficult to remove using common solvents may in fact be water based and are removed by soaking with ordinary water; but beware that depending on age, these non-asphalt mastics may also have contained asbestos. Non-friable asbestos flooring mastics: Finally, where (most) asphalt based and other mastics and cut-back adhesives are generally not friable, the potential asbestos exposure hazard will be affected more by the means used to remove the material than by the material in its applied-state. Follow recommended wetting and cleanup guidelines. Reader Question: Is it likely that this bath ceramic tile black mastic in my 1986 home would contain asbestos? I posted a question in the Comments section regarding my bathroom Reno. Shown here: reader's photos of ceramic bath tile and black tile mastic in a 1985-1986 Australian home. My house is from 1985/86, the cement sheeting in the shower areas say “Manufactured With Asbestos”. Before I remove the wall tile, I would like to know if there is any chance the adhesive could contain asbestos. I am sending images as requested. In both the U.S. and Australia it would be unusual for new construction in 1985/6 to have used asbestos products. At the time of my initial reply I had not yet seen your photos of the mastic used behind ceramic bath tile, nor your backer board photo, so I offered this general advice: I'm not sure if you saw my note or if I was clear before about the possibility of asbestos in tile mastic. From the fact that you saw asbestos-suspect wall materials it certainly believable that a contractor would have used a mastic that contained asbestos. However that's not a friable material unless you grind or saw to make a Dusty mess. I would much like to see a photo of the printing on the cement board or asbestos board that you found. Also if you tell me what your plans are for the wall I might be able to make a suggestion. That is are you just stripping tile or do you need to take the whole wall down. Here is a picture of the cement sheet, (shown above) this on several of the sheets in the other bathroom in the house. I was planning on just removing the tile, but if I have to, I can certainly remove the whole sheets containing the tile. Aha so we found that the wallboard was marked as NOT containing asbestos. An easy misread to make when we're nervous about asbestos in a home. 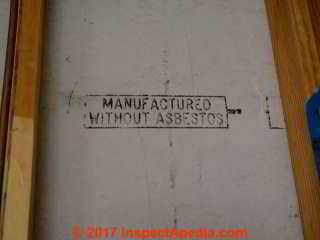 The no-asbestos stamp on the cement board in your home reminds us that at the time your house was built, manufacturers as well as installers of fiber cement tile-backer board and other cement board products faced customers who wanted to be sure they were not being sold old-stock of asbestos containing products. One could speculate that the same contractor who installed such cement board would not have intended to use a mastic tile adhesive that contained asbestos. OPINION: Adding that to the generally not friable nature of tile mastics the risk of asbestos from the wall demolition is likely to be low. 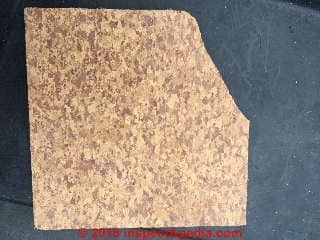 Only if you were facing an unavoidable requirement to grind, chop, saw or otherwise make a dusty mess might you add asbestos to the general concern that you ought to have anyway about avoiding breathing demolition dust. Hi, I just pulled up some tile in my dining room that was covered with laminate flooring. I’m now worried it is asbestos tile. It is 9 x 9 and our house was built in 1960. I see what looks like a cork pattern vinyl-asbestos floor tile with black mastic adhesive on the tile reverse. ADVICE: For buildings with floor tiles or sheet flooring that can be assumed to have been installed in North America before 1986 it would be prudent to treat the flooring as "PACM" or "Presumed Asbestos Containing Material". The presence of known or assumed asbestsos-containing flooring does not mean we should panic nor that we must undertake an expensive and dangerous asbestos removal project. Continue reading at ASBESTOS-CONTAINING MASTIC DANGEROUS? or select a topic from closely-related articles below, or see our complete INDEX to RELATED ARTICLES below. 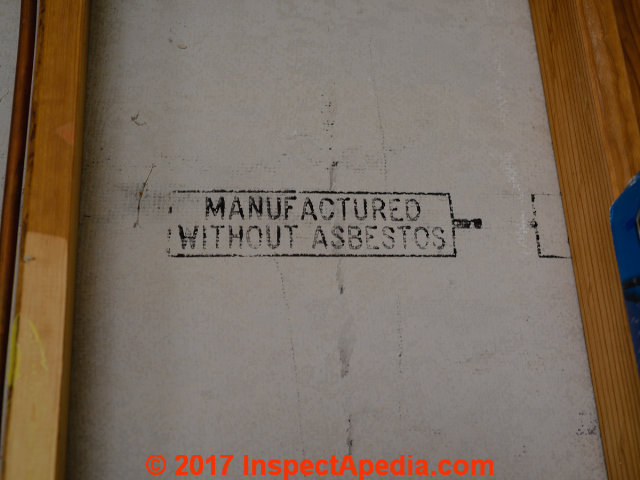 ASBESTOS MASTIC IDENTIFICATION at InspectApedia.com - online encyclopedia of building & environmental inspection, testing, diagnosis, repair, & problem prevention advice. LIFE Feb 14, 1955 p. 105, advertisement for Congoleum flooring products and listing of Gold Seal products by Congoleum. Prior Informed Consent Procedure for Certain Hazardous Chemicals and Pesticides in International Trade on 10 September 1998. There are 40 chemicals listed in Annex III of the Convention and subject to the PIC procedure, including 25 pesticides, 4 severely hazardous pesticide formulations and 11 industrial chemicals. Many more chemicals are expected to be added in the future. The Conference of the Parties decides on the inclusion of new chemicals. Asbestos, Its Industrial Applications, D.V. Rosato, engineering consultant, Newton, MA, Reinhold Publishing, 1959 Library of Congress Catalog Card No. : 59-12535 [out of print, original copy, text and images on file at InspectAPedia.com offices]. Abstract: Asbestos was widely used as a building material prior to the 1970's. It is well known that asbestos is a health hazard and its progressive elimination is a priority for pollution prevention. Asbestos can be transformed to non-hazardous silicate phases by microwave thermal treatment. The aim of this investigation is to describe the microwave inertization process of asbestos containing waste (ACW) and its recycling in porcelain stoneware tiles, porous single-fired wall tiles and ceramic bricks following industrial manufacture procedure. Inertised asbestos powder was added in the percentages of 1, 3, and 5 wt.% to commercially available compositions and then fired following industrial thermal cycles. Water absorption and linear shrinkage of the obtained industrial products do not present significant variations with additions up to 5 wt.% of microwave inertised ACW. 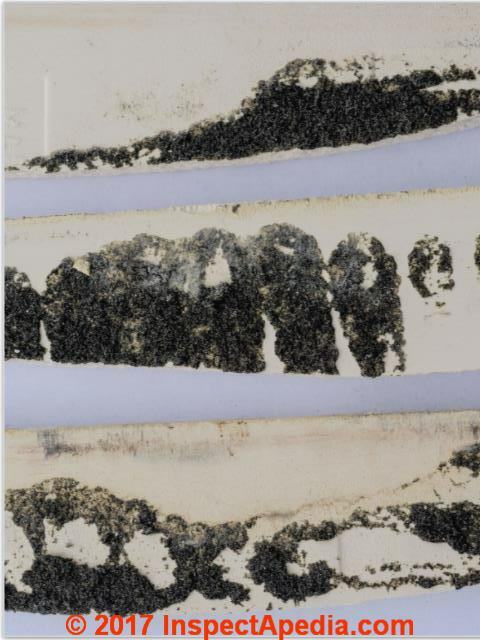 "History of asbestos discovery and use and asbestos-related disease in context with the occurrence of asbestos within ophiolite complexes", Malcolm Ross, Robert P. Nolan, Geological Society of America, Special Paper, 2003. Abstract: Two ancient asbestos mines, one near Karystos, Greece and the other southeast of Mount Troodos, Cyprus, were located in what we now know to be ophiolite terrane. Evidence suggests that asbestos was discovered and utilized in Cyprus,perhaps as long as 5000 years ago, for manufacture of cremation cloths, lamp wicks, hats, and shoes. Some of the adverse health effects became known only in the early twentieth century, but it was not until the 1960's that the asbestos-related diseases - asbestosis, lung cancer, and mesothelioma - were fully understood. Approximately 855 of the world's asbestos was produced from ophiolite complexes, most of which as the chrysotile variety; termolite, actinolite, and anthophyllite asbestos accounting for only a few percent of the total. Asbestos minerals crystallize within tectonized ophiolites -along shear, fault, and dilation zones, and at contacts with intruded dikes and sills. Important chrysotile asbestos mines are found in the ophiolites of eastern Canada, the Russian Urals, California, northwest Italy, northern Greece, and Cyprus. A high incidence of mesothelioma, a cancer of the lugn lining, is reported among residents of villages located within or near ophiolite complexes in Greece, Turkey, Cyprus, Corsica, and New Caledonia. These villages were exposed to tremolite asbestos while processing stucco and whitewash for application to homes. Asbestos contamination in various geographic localities has generated concern about health risks and has prompted costly remediatl actions, especially in the United Kingdom and the United States. A scientific basis for public policy is offered to address the utilization of asbestos-bearing rocks. 57 F.Supp. 339 (1965), TILE COUNCIL OF AMERICA, INC., Plaintiff, v. CERAMIC TILERS SUPPLY, INC., Defendant. No. 62-267. United States District Court S. D. California, Central Division. August 13, 1965. Quoting "the 392 patent ... It also discloses composition containing the ingredients above mentioned which include sand as well as one which includes asbestos but not sand together with the other ingredients heretofore mentioned. The 382 patent also discloses a method of manufacturing such compositions." mixtures similarly to the protocol used in Gualtieri and Tartaglia  "
" The product of transformation of cement–asbestos (CATP) has a phase composition similar to that of a natural or a low temperature clinker with the exception of having a larger content of aluminium, iron and magnesium. This product can be safely recycled for the production of stoneware tile mixtures. The addition of 3–5 mass% of CATP does not bear significant variations to the standard parameters of white porcelain tile mixtures. " A process has been developed for bonding chrysotile asbestos into a robust, dimensionally-stable lightweight ceramic material by fusing it with sodium silicate and/or ground waste glass. The chrysotile can retain its desirable properties of fibrous morphology and porosity, but the fibre bundles are stabilized by fusion into a glassy matrix, reducing the respirable fibre concentration. The glass-bonded materials have good resistance to mechanical abrasion, and any resulting dust is found by SEM to be particularly free of fibres. The thermal treatment also converts the chrysotile into crystalline forsterite, which should destroy its cell toxicity. Other methods of glass-bonding chrysotile compacts (hot pressing and impregnating with glaze) were also investigated, and the properties of the resulting materials are reported. Author: Mackenzie, K. J. D.
Barsoum, Michael W. (1996). Fundamentals of Ceramics. New York: McGraw-Hill. Bender, W. and F. Handle, eds. Brick and Tile Making: Procedures and Operating Practices in the Heavy Clay Industries. Bauverlag GmbH, 1982. Kingery, W. D.; Bowen, H. K.; and Uhlmann, D. R. (1976). Introduction to Ceramics , 2nd edition. New York: Wiley. Pellacani, G. and T. Manfredini. Engineered Materials Handbook. ASM International, 1991, pp. 925-929. The mission of CTIOA: To promote appropriate and expanded use of ceramic tile and natural stone through education. The Ceramic Tile Institute of America Inc. provides manufacturer’s information only. The Ceramic Tile Institute of America Inc. does not test the products listed nor do we validate manufacturer’s claims. The Ceramic Tile Institute of America inc. is not responsible for the performance of the products shown on this	site. Talc is added to certain clays as a “flux” to lower the temperature at which the clay needs to be heated. The DPH has become aware that the talc from at least one mine in the Northeast may be contaminated with a type of asbestos called anthophyllite. Although there has been debate if the asbestos found in talc actually falls under the regulatory definition of asbestos, there is enough uncertainty to warrant caution when using clays with added talc. A recent court case in New Jersey found talc mined by the R.T. Vanderbilt Company of New York was responsible for an asbestos-related cancer ( mesothelioma) in a pottery shop owner. The pottery shop owner had purchased talc (Nytal 100) in large bags and mixed it in clays he used and sold. Milton Bradley made Fibro-Clay from 1967 until 1975, when it ceased manufacture of the product. The firm stated that no asbestos has been used in the formula since 1972, and that the quantity sold by its Educational Division was relatively small. Asbestos Testing Laboratory Survey, Daniel Friedman (editor), InsapectAPedia.com, March 2012. Using the U.S. NIST directory of accredited laboratories certified for asbestos fiber analysis, [http://ts.nist.gov/standards/scopes/plmtm.htm] we polled at least one laboratory in each U.S. state, Puerto Rico, two Canadian Provinces, and laboratories in Japan and Korea, asking each if their laboratory had ever received ceramic tiles for asbestos testing and whether or not their lab had ever detected asbestos in ceramic tiles used on walls, floors, or other building services. Results will be included in this article. Phillip A. Peterson, Vice President, Fibertec Industrial Hygiene Services, Inc., 1914 Holloway Drive Holt, MI 48842, Phone: 517-699-0345, ext. 1, www.fibertec.us. Personal correspondence 3/14/2012 - DJF. "Arts and Crafts, an Industrial Hygiene Challenge", Monona Rossol, The Synergist, May 2012, pp. 34-37American Industrial Hygiene Association. ACTS is a not-for-profit corporation that provides health, safety, industrial hygiene, technical services, and safety publications to the arts, crafts, museums, and theater communities. A part of the fees from our consulting services goes to support our free and low-cost services for artists. We gratefully accept donations, but do not solicit them from the artists who call here for help and advice. We recognize that artists and performers are among the least affluent groups in society. ACTS also will not accept money or take advertising in our publications from manufacturers of artists materials or businesses whose interests could conflict with ours. We want artists to know that we have no financial incentive to make our product and safety recommendations.